Last week, we took a look at Magus from Chrono Trigger. This week, we focus on his henchmen. Magus’ main general is Ozzie, a monster who found Janus as a child and raised him to be the Fiendlord. Like other military officers, he prefers to let others do his dirty work. When confronted in person, he usually either tries to run away or play a convoluted trick. He seems to be Magus’ second-in-command, but two others named Slash and Flea rank quite high as well. Their names are references to rock musicians Ozzy Osbourne (despite the different spelling), Slash from Guns ‘n’ Roses, and Flea from the Red Hot Chili Peppers. It’s sort of like how a lot of the Koopalings were named after musicians. Their original Japanese names follow a different theme, calling them Vinegar, Soy Sauce, and Mayonnaise. Slash is a skilled swordsman, while Flea is a magician who specializes in illusions. He’s also a cross-dresser, but it doesn’t seem like anyone was that concerned about this. Not that they should have been, but I have a feeling they would have had this been a TV show instead of a role-playing video game. Anyway, after Magus’ defection, the three relocate to Fort Ozzie. Taking them down results in Ozzie’s descendants no longer being in charge of the village of Medina (not the same as the one in Saudi Arabia), with Ozzie VIII instead being employed as a servant to an imp. That’s the last we see of the three fiends in Chrono Trigger, but they apparently show up for an optional boss battle in Chrono Cross, in which they’re hanging out at the Bend of Time. They don’t appear in the plot, but you could say their spiritual successors as comic-relief villains are Solt and Peppor Shaker, two buffoonish brothers who somehow became Acacia Dragoons despite their incompetence. Their role is largely to unwittingly provide advice on battle techniques through their bungling. Why General Viper keeps these idiots employed is anybody’s guess. Ozzie might have slipped into moron mode when backed into a corner, but he was competent when in command. Anyway, as you may have noticed, the Shaker Brothers’ names fit with the condiment theme established in the Japanese names of Magus’ officers. The brothers’ names in Japanese are the fairly similar Sugarl and Solton. 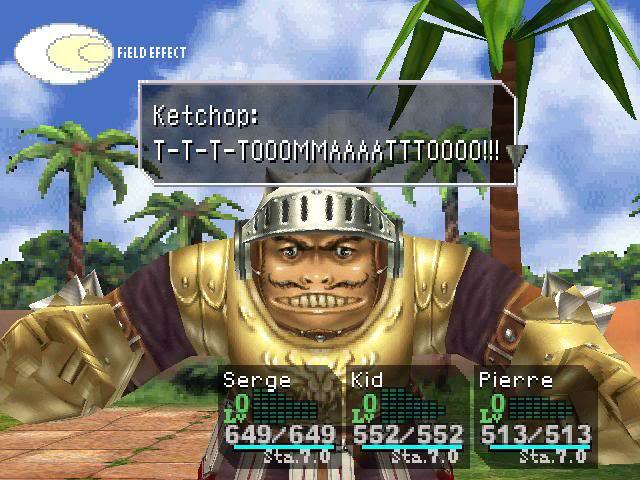 Also, at one point in the game, the Shakers are accompanied by a warrior named Ketchop. 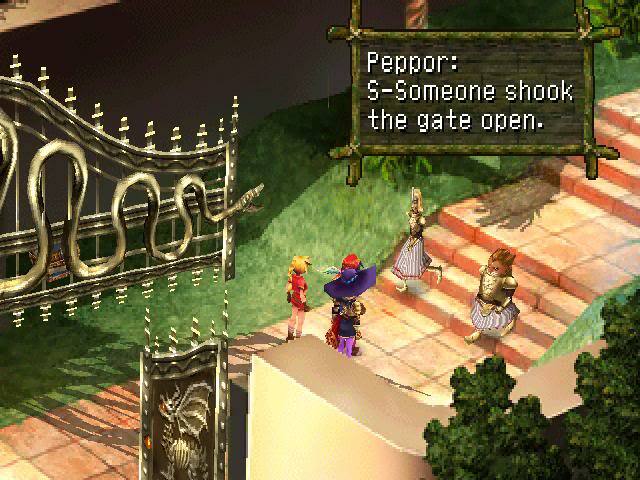 This entry was posted in Chrono Trigger, Video Games and tagged acacia dragoons, chrono cross, flea, general viper, janus, ketchop, magus, monsters, ozzie, ozzie viii, peppor shaker, slash, solt shaker. Bookmark the permalink. 2 Responses to Ozzie’s in a Pickle!